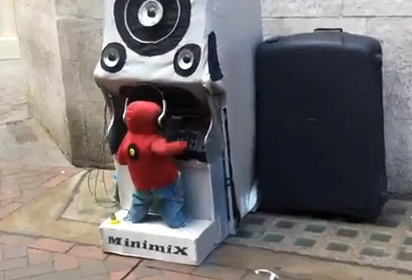 Mini Mix, the street performance brainchild of Bart Delpech just might be the world’s smallest DJ. Even smaller than Baby Chino, who quite possibly held the reigns before Mini Mix. Bart Delpech has a long background in the arts which began while he was a teenager working in the circus. He has now turned his experience in puppetry into what you’ll see in the video below which is being described as MiniMix, the DJ Puppet. It’s really quite amazing. It took me a while at first to figure out just how he was doing it and after seeing him behind the booth working the controls, it’s still just as brilliant as the video portrays. Now, I’ve got no shot at being the world’s smallest DJ, but maybe I can work at being the world’s “something-est” DJ. The world’s most average-height DJ, the world’s most vanilla soy chai-loving DJ, or something like that. felis elementum dolor. Nullam justo diam ipsum commodo consequat.